NAPA, the leading maritime software, services and data analysis provider has today announced a comprehensive service and product agreement extension with Carnival Corporation, the world’s biggest cruise company with a combined fleet of more than 100 vessels across 9 cruise line brands. This covers comprehensive services for the onboard NAPA Loading Computers, training certification for Carnival’s CSMART training facility, and a framework agreement for future deployments of NAPA solutions. Carnival’s commitment to the highest performance standards for its ships and safety for its passengers and crew has led to its early adoption of solutions such as NAPA’s electronic logbooks, voyage reporting, and flooding decision support systems. These technologies, as well as numerous others, have been developed in close co-operation with Carnival over a working partnership that has spanned more than 15 years. Today, every ship in the Carnival Corporation fleet has NAPA technology solutions on board that help monitor risks in real time and improve decision making in an emergency. One of the most important advances in NAPA and Carnival’s cooperation has been the development of the NAPA Emergency Computer to meet the need to have a precise, simple, and robust onboard decision support system for flooding incidents that exceeds the requirements of the regulations. NAPA Emergency Computer has been installed on all Carnival newbuilds since 2016 and installations to selected existing ships started last year with Princess Cruises’ Royal Princess and Regal Princess. An agreement has also been signed to refit Carnival Splendor and Carnival Breeze with NAPA Emergency Computer. 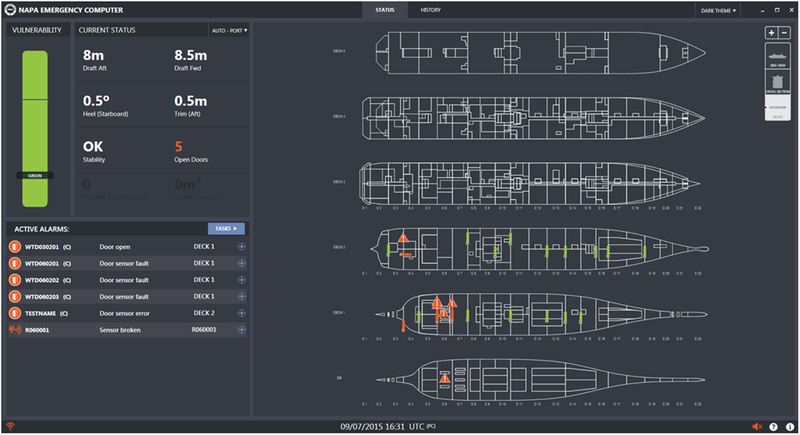 NAPA Emergency Computer’s vulnerability monitoring is needed to increase awareness of an intact ship’s safety level by taking into account potential risks. NAPA Emergency Computer continuously monitors for faulty sensors, open watertight doors and sea condition. The overall vulnerability level is shown as a green-yellow-red color code. In its 30 years of operation, NAPA has become a global leader in software, services and data analysis for the maritime industry; providing best in class data-led solutions for safety, efficiency and productivity in both ship design and operations.